The siding marketplace was dominated by contractors selling white, pale white and off-white choices. Alcoa Building Products played in this space at the mercy of their supply channel and distributors. The Agency took up the challenge to convert a B2B to a B2C brand, developing a new name for the company, new logos, names and color palettes for the products, and a new consumer-facing brand approach that took matters of color and style out of contractors’ hands and put it in the hands of the homeowner. New packaging was designed. New product displays, shelf talkers, and DIY materials were developed. 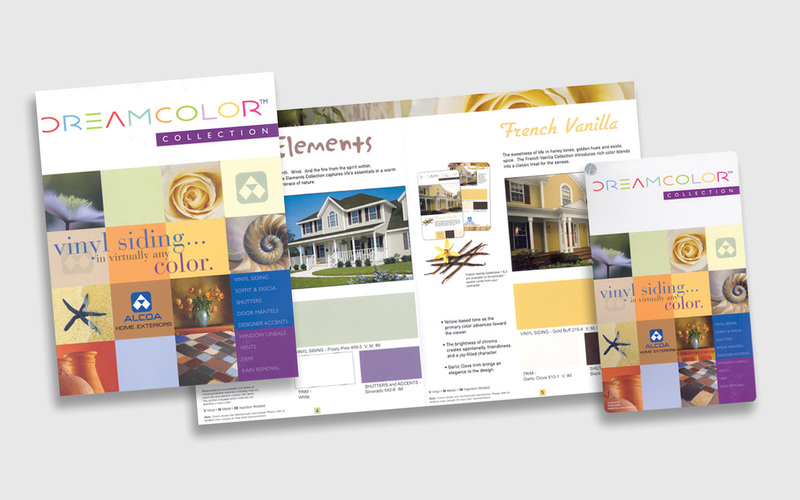 New brochures, direct mail, yard signs, contractor kits and radio and television were created. And a complete annual promotional schedule with materials was put together and implemented. As a unique part of the brand, “Dream Color” was created – the ability for a homeowner to create siding of any color in the rainbow, matched perfectly with an Alcoa-PPG Paints partnership, coordinated through the Agency, and delivered just-in-time to the job site. The Home Exteriors brand, along with its sub-branded product lines, became the most profitable division for Alcoa and was sold for a large ROI to PlyGem.